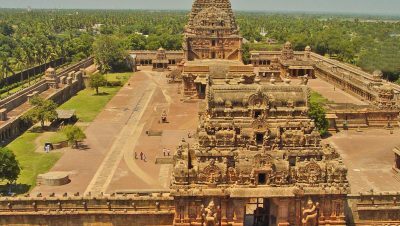 The Big Temple of Tanjavore is a stunning monument that speaks oodles about the architectural mastery of the Chola era. This 212 ft (64.8 meter) towering Shiva temple is home to one of the largest Shiva Lingas of the country. A majestic Nandhi (bull), measuring a gigantic 19.4 ‘ x 8.23’ x 12’ (5.94 x 2.51 x 3.66 in meters) stands guard over the temple. 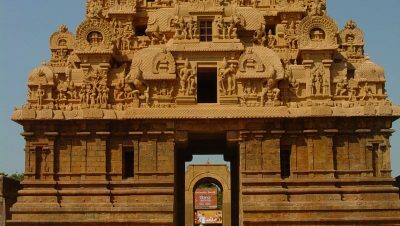 This is the second largest Nandhi in India and is carved out of a single stone. Everything about this temple is big, majestic. No wonder it is referred as The Big Temple. Nearest Airport: Trichy. 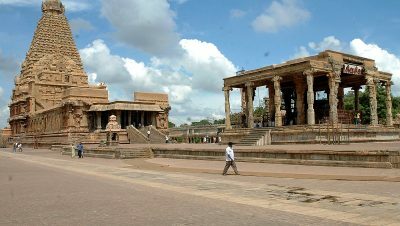 Thanjavur can be reached by bus or train from Trichy. Hotels are available in Thanjavur town.